Are you umming your way through your presentations? Welcome to your high impact tip of the day! 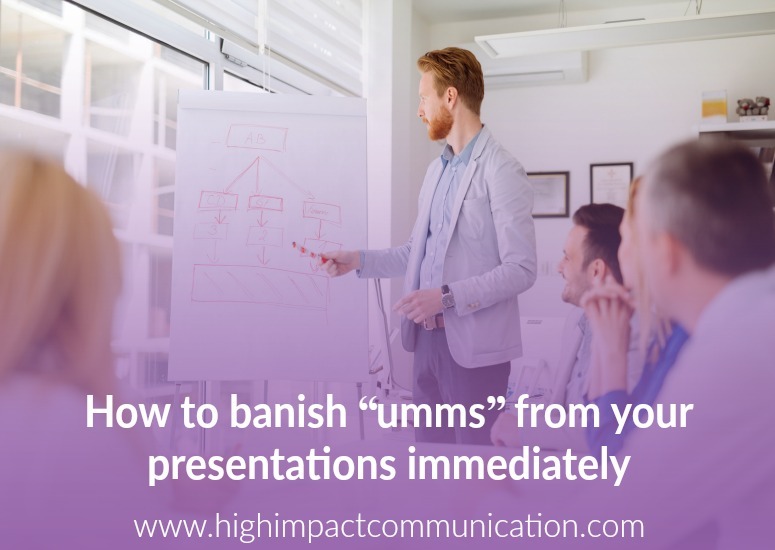 So many of the professionals I work with are cursed with a serious case of the “umms.” These umms creep into every silence and transition of their presentations. And the unfortunate truth is, nearly every professional I’ve met was completely unaware of the degree to which they were umming their way through their communication and even more in their presentations. That is, until others told them. So embarrassing! Do you want to stop umming your way through life? Do you want to learn to speak with more intention and authentic charisma? Learn how to eliminate or at least minimize the troublesome umms that get in the way of you optimizing your message. The video tutorial below will provide you with the tips and tricks you need to start recognizing the problem. Better yet – it’ll help you start eliminating those sneaky umms for good! Improve your communication and presentations today! I can help you become a more effective communicator. Since you communicate constantly, it is essential that you do it with high impact. I will send you tips every so often to help you powerfully communicate with greater authentic charisma. Grab my free tips for CEOs & Business Professionals or my free tips for Design & Construction Professionals. This is the first step towards improving your ability to communicate with impact, effectiveness, and genuine authenticity.